Gardening Hedge Shear. Shearing & Scissors. Drive Socket / Wrench. Wrench / Ratchet Spanners. Chain, Rope & Rigging. Air Nail Guns. Knife Blades. Power Saw Accessories. Wolf Garten professional pruning saw Made in Germany high quality double edge blade for smooth effortless cutting. Wolf Garten professional pruning saw Made in Germany high quality double edge blade for smooth effortless cutting. Manufacturer: Bahco. • Fits all Bahco poles: AP-2.7M, AP-3M, AP-5M and FP-3M. • Combination pruning saw with plastic handle. • Can be used handheld or with a 25 mm (1") Ø extension pole. PICK UP: We do not cater for item pickup. 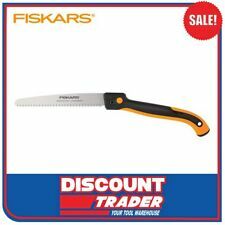 Fiskars 10" Steel Blade SoftGrip?. Folding Pruning Saw - 9047. A great combination of cutting power and comfort, whether youre cutting overhand or making undercuts. Our Power Tooth Softgrip Folding Saw features a triple-ground blade that makes aggressive cuts to help you power through thick branches faster. ALLOY STEEL BLADE FOR SUPER FLEXIBILITY. NON SLIP NOTCHED GRIP PREVENTS ACCIDENT DROPPING. COMFORTABLE GRIP. Product labelled as 9333. Fiskars rope model steel head tree pruner 93016059. Fiskars Tree pruner - model 9300. Fiskars Tree pruner - model 9261. Fiskars Tree pruner - model 9240. The Folding Pruning Saw is intended for rough-cut pruning and trimming of smaller branches, giving a fast cutting action in awkward areas. The blades are manufactured with tool grade stainless steel for high strength and hardness, finished with large, triple ground saw blade teeth to give superior, razor sharp edges for a fast cutting performance. Size:7"/180mm. Acres of Bargains. With hand protection function. Triple teeth(Precision ground teeth 3 edges). 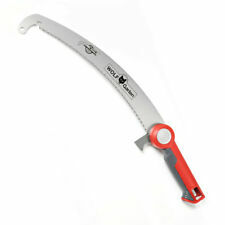 Folding saw 27cm long pruning sawwith safety lock. Mainly used for harvesting machines, wood saws. Ideal for cutting firewood in survival situations such as hiking, camping, picnicking, rock climbing and so on. Lightweight and portable, easy to use, a good tool of survival. Ideal for cutting firewood in survival situations such as hiking, camping, picnicking, rock climbing and so on. 1 Survival Hand Chain Saw. Applicable Scene: Outdoor Camping. Color: Orange (As Picture Show). An Opinel small saw with a 12cm blade which cuts branches effortlessly. Perfect for the garden, this tool is also useful during outdoor activities, it turns out to be very handy and efficient. Handle - Beech is the most commonly used wood for the manufacture of Opinel handles. Extra Large teeth for the fastest Zubat ever. Extra Large teeth for the fastest Zubat ever. With this style and size of the teeth, it will leave you blown away. 5.5 teeth per 3cm ,330mm. Blowers Lawn Mowers Chainsaws Hand saws. Brushless motor. Motor Brushless. 8" Bar & Oregon Chain. Shoulder Harness. Automatic Chain Oiler. Tool Free Chain. Bank account details are available on checkout. All prices are GST inclusive. Also accepts “T" shank jig saw blades, making it great for common DIY projects. 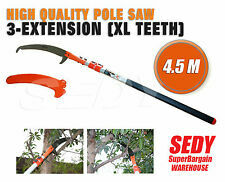 150 mm blade with serrated teeth easily cuts through branches up to 75 mm thick. Compact, lightweight design allows users to reach tight spaces. Safer and easier cutting at height without a ladder when used with extension pole. Attaches with an adjustable clamp to poles of 25mm (1") up to 35mm (1.3/8") . Can be used with adaptor ASP-ATP on ASP- and ATP poles. The blade is taper ground, has a kerf of 0.76 and coated to protect it from rust and resin. The teeth are non-set, fine and have been hardened to give extended life to the saw. They are Silky's special Mirai-Me teeth, which give an amazingly smooth cut. There are 26 teeth per 30mm. The new folding design allows the blade to fold away quickly and easily. The blade has two locking angles. The handle is coated in Silky's award winning GOM rubber which gives exceptional grip and comfort for extended use. There are two other blade options for this handle. Code 384-24 has 32 teeth per 30mm and is braced and does not have hardened teeth. Code 388-24 has 32 teeth per 30mm and has hardened teeth. All parts are replaceable and covered by a limited lifetime manufactures warranty. It has a tooth style which will cut dense and sappy timbers with ease. It has a hollow-ground blade, which reduces friction when cutting. This style of tooth creates a very smooth cut which leaves the branch so smooth that it will appear as though it has been given a light sand. The Sugowaza is a PULL saw. All cutting occurs on the pull stroke. Put a minimal amount of pressure as you pull the blade toward yourself and then glide the saw forward. On the forward stroke the teeth will clear of timber or material and then on the pull stroke the saw will do the cutting again. Manufacturer: Felco. • Efficient: conical blade shape for an easy, non-clogging cut / the set and shape of the teeth prevents sap build-up / maintenance free. Pull-stroke The pull-stroke technique reduces effort and eliminates the risk of the blade pig-tailing. • Foldable pruning saw with special patented XT7 toothing for a fast cut in hard or dry wood. • Multipurpose saw with Hard-Point teeth, performing well in living wood. 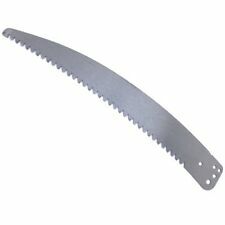 This is a heavy duty 375mm long hand saw. It is designed to be an alternative to a small chainsaw with a straight blade, but angled handle that can be held with one or two hands. All parts of the saw are available and replaceable. Manufacturer: Felco. PICK UP: We do not cater for item pickup. Item Specifics. - The product is not fit for the purpose, or. All right reserved. SKU: I002214_EACH. Owned & Operated. Bahco 396-JT Foldable Pruning Saw, JT Toothing. Fast clean cutting in soft or green wood with the Japanese toothing. Spare blades available. Safety lock in both open and closed positions. 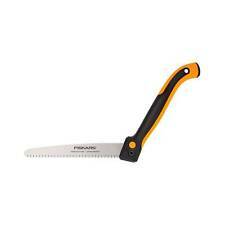 The Husqvarna Folding Saw 200 FO belongs to the new generation of Husqvarna saws. 4211 hardpoint teeth. Bahco Pruning Saw with Wooden Handle. 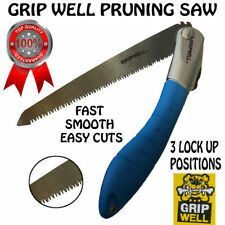 Pruning saw for dry or hard wood. Comfortable beech wood handle. The No.1 Choice for Tough to Remove Blackspot Algae. Professional Baracuda Blackspot Algae Killer Concentrated Granular 1kg. Baracuda Blackspot killer works on stubborn algae strains in pebble pools and ageing pool surfaces. Fruit tree pruning saw F-300. Easily removable blade. Blade Length 300mm. Blade Thickness 0.70mm. Favored by landscapers for their light weight and rugged, black plastic scabbard with convenient belt loop for easy carrying. WOLF GARTEN | Hand Saw with Sheath, Fixed handle WOLF GARTEN | Hand Saw with Sheath, Fixed handle The WOLF-Garten® Hand Saw is one of the best tree saws on the market. This handy garden tool will be by your side whenever you may need it.